Violet Eden has accepted that she's part angel, part human-but nothing prepares her to be handed the key to the gates of Hell. Or worse, to be forced to turn the key over to the dark exile who saved and betrayed her: Phoenix. Violet and her partner, Lincoln, will have to stop Phoenix, but it's hard enough fighting their soul-crushing need to be together. Violet begins to fear that the pull will soon become unbearable. As a brutal battle looms, Violet finds herself in dire straits as she teeters on the edge of a decision that could unleash a terror of horrifying repercussions. 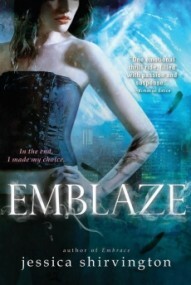 What I liked: action, non-stop thrills and romance - Emblaze has everything fans of The Violet Eden Chapters love. The battle to stop Phoenix takes Violet, Linc and the rest of their crew to the beautiful island of Santorini and from there, all hell breaks lose - almost. Twists and turns keep the story moving, the tension between Violet and Lincoln keeps you guessing and the cliff hanger of an ending will have you begging for the next installment in this series. Final verdict: Good addition to the series. I could feel his eyes on me. Violet is back! I'm totally a huge fan of this YA paranormal series. So when I received a galley of the third book, I did my own Snoopy dance of happiness! Right off the bat, fallen angels literally crash in on Violet. But this time it’s around fellow classmates. Her fellow Grigori show up to help out. Just when she thinks they have things under control, her father takes a sudden interest in what’s going on with her. Not cool. Then Phoenix and his own band of fallen angels kidnap Steph. Violet needs to team up with her trainer and possible soul mate Lincoln in order to get her friend back. Once again not all is what it seems. Violet ends up having to go to the Greek island Santorini in order to exchange some ancient scriptures to get her friend back. She has to trust Phoenix, a rogue angel that he’ll not renege on his promise to get her friend back. One drawback is Phoenix wants the scriptures to unleash Lilith, the ultimate evil. Violet battles not only evil but her heart in this very satisfying third book. I can sum this book up in one word: Wowza! There is so much to love about this series. There’s a love triangle, action, suspense, mystery, and lush descriptions. This series is highly addictive! Just when you think you know what will happen next, the author throws in a curve or two to take you off guard. Violet’s father ‘suddenly’ is interested in what’s going on with Violet and this gets in the way. Add Josephine, a leader, who has her own secrets and interest in Violet. The biggest plus of this series has to be the emotional punch that happens between Violet, Lincoln, and Phoenix. I have to say Phoenix is a great anti-hero. He does things for his own purposes, like kidnapping Steph in order to get the scriptures. But though he does terrible things he can’t deny his feelings for Violet. The reader isn’t quite sure what to think of this fallen angel or like Violet, whether or not to trust his true intentions. Well-written with a huge wowza factor, I dare you to not get caught up in this tale!